Thicker looking hair in moments. Mane is the perfect answer if you have fine thinning hair. 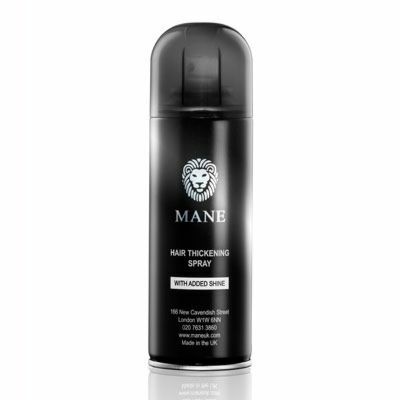 Mane comes in an easy to use spray that will give your hair a thicker, fuller, natural appearance in seconds. Mane is suitable for men and women and because it comes in a range of eleven colors can be easily matched to your hair any way you like and because it can only be removed when you shampoo your hair, you can follow your normal lifestyle with absolute confidence. That's why many film and television personalities use Mane. Main. Ideal for hair thickening spray is suitable for men and women with any of the following hair conditions: Fine and/or thinning hair. Small areas of hair loss. General hair thinning after pregnancy or illness. Alopecia Aerate patients. Mane has been medically recommended for use by hair transplant clients. What people say about Mane. Newspapers. 'A revolutionary hair spray which will make look thicker until the next shampoo is being manufactured by a Harley Street Clinic. Mane is not a gimmick but actually works'. Hair and Beauty. There's no 'cure for hair thinned by the menopause, but there are products that can make your hair look thicker and color it at the same time. Try Mane'. Miriam Stoppard - TV Times. Radio and TV. ' I would just like to let you know how pleased we are with Mane Spray Hair Thickener, some of which I have just re-ordered. It has proved a great success with actors'. Yorkshire Television Make - Up Department. 'I would like to take this opportunity to let you know how very pleased we are with this product. It has proved very successful as a hair thickener for quite a few artists with threatening baldness'. Thames Television Head of Make - Up. 'I found it absolutely marvelous. I can create hair styles that I would have been unable to do before I used Mane'. A.W. (Swansea).